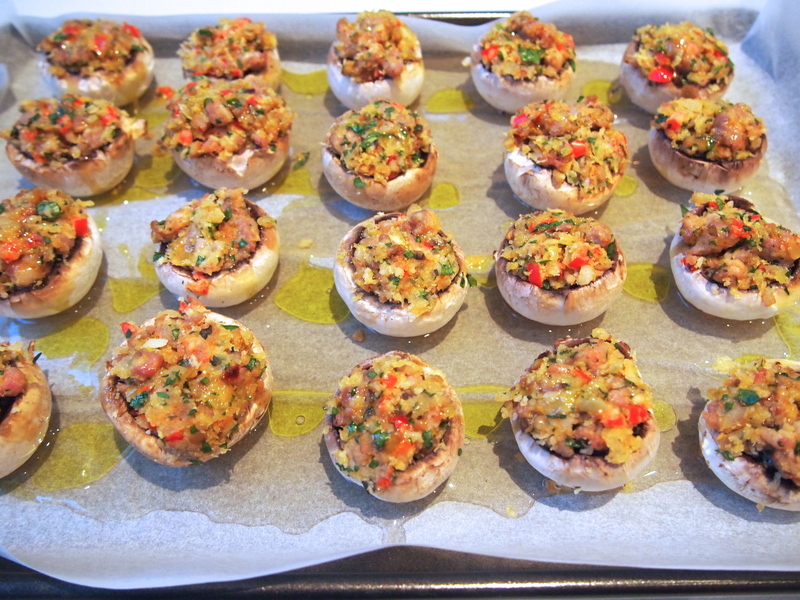 These little sausage stuffed mushrooms make a great canapé to serve with drinks. The best thing about them, apart from being delicious, is that they can be prepared well in advance and baked just before serving. There are so many variations you can make with these. Sometimes I leave out the sausage and just make them with bread crumbs, peppers, herbs and cheese and sometimes I use crumbled chorizo to replace the Italian style sausage which is also delicious. 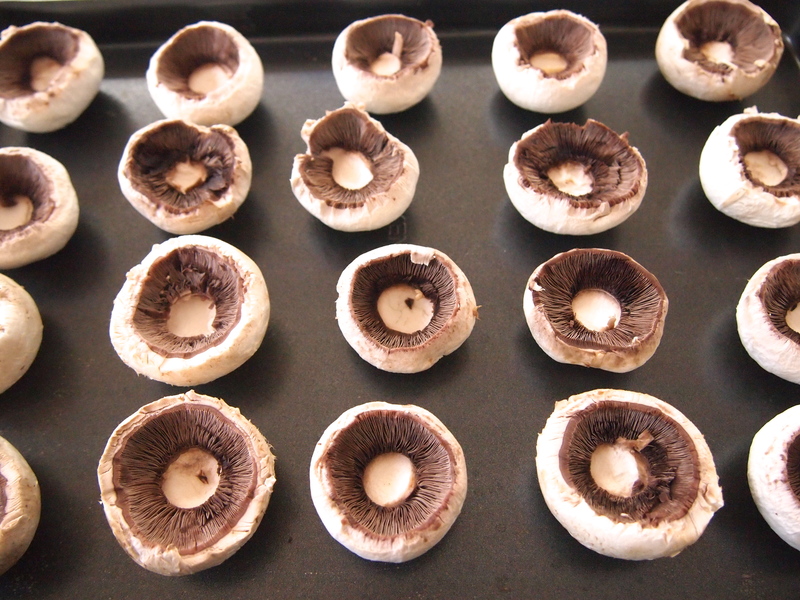 To serve as a canapé I like to find mushrooms that are on the small side – not button mushrooms as they’re too hard to fill, but cup mushrooms that are about an inch and half in diameter are perfect, keep in mind they do shrink down a little when they cook. I normally aim to make at least 3-4 per person as they’re very moreish and disappear fast! Preheat oven to 200C. Heat about 2 tablespoons of olive oil in a frypan or skillet. Add the onion, pepper and a pinch of salt and cook over medium heat until they are softened, about 5-7 minutes. Add the garlic and cook for another couple of minutes. Take the sausages out of their casing and crumble them into the pan. Cook, breaking up the sausage with a spoon until it’s cooked through and starting to brown. Remove and set aside to cool. Place the breadcrumbs, parsley and parmesan cheese into a bowl. 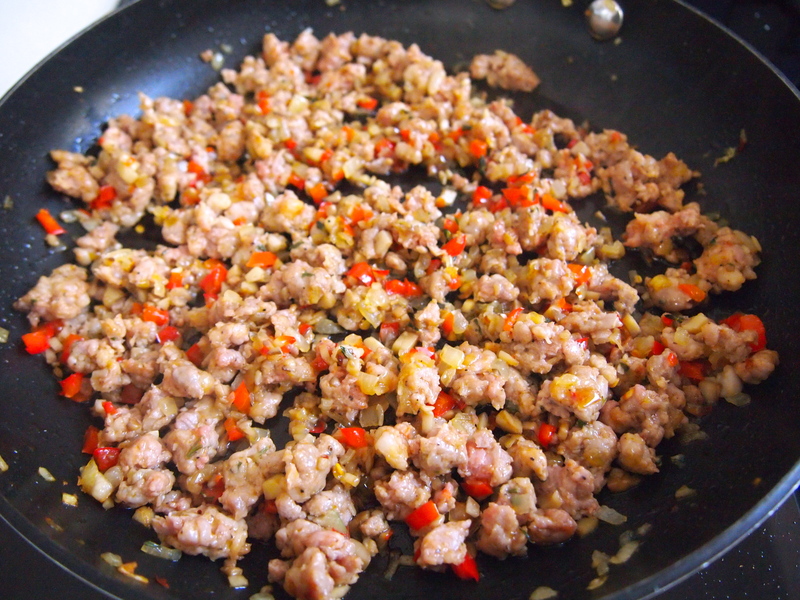 Add the cooled sausage mixture and stir to combine. Season with salt and freshly ground black pepper. Mix thoroughly to combine. Take your mushrooms and remove the stem from the cup. I sometimes peel back some of the skin on the mushrooms if they are thick, this also makes more room for filling as it removes some of the flesh from the sides of the mushroom. Place some baking paper on a baking sheet. Pour the white wine, stock and 2 tablespoons of olive oil on the paper – there should be enough liquid to thinly cover the base, if your baking tray is large just add a little more stock. 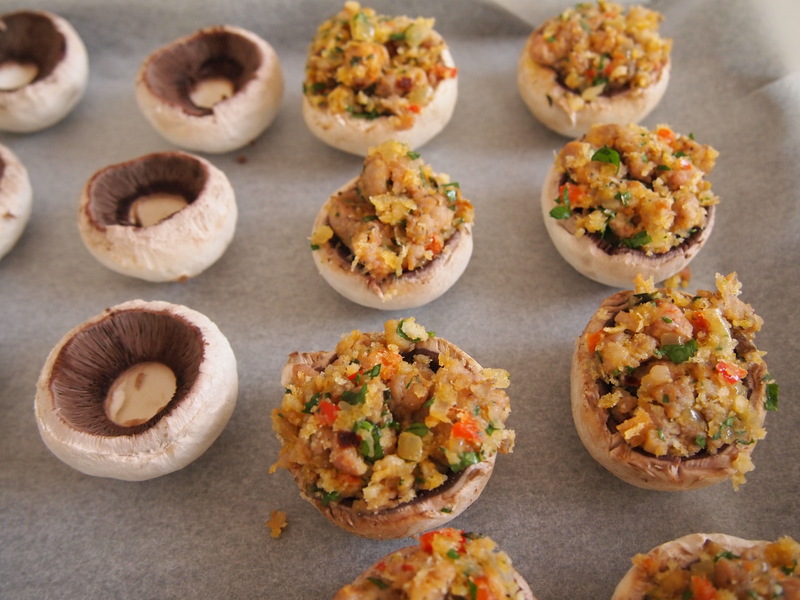 Take a mushroom and add enough filling in the exposed cup to fill it generously, I like to fill them quite high as they do shrink down a little. Place the mushroom on top of the stock and wine mixture and repeat with remaining mushrooms. 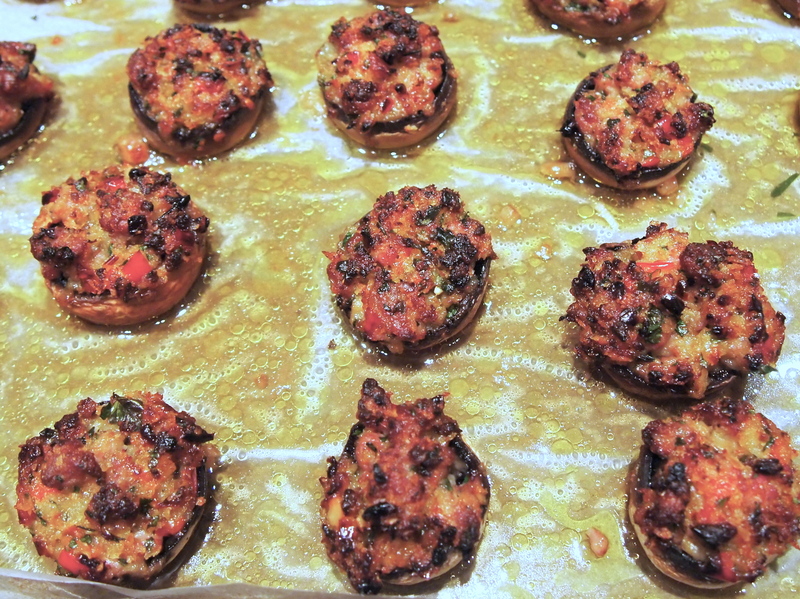 Drizzle the tops of the mushrooms with a little olive oil and place in the pre-heated oven and cook for 20 minutes or until the mushrooms are tender and the filling is golden brown and crispy. 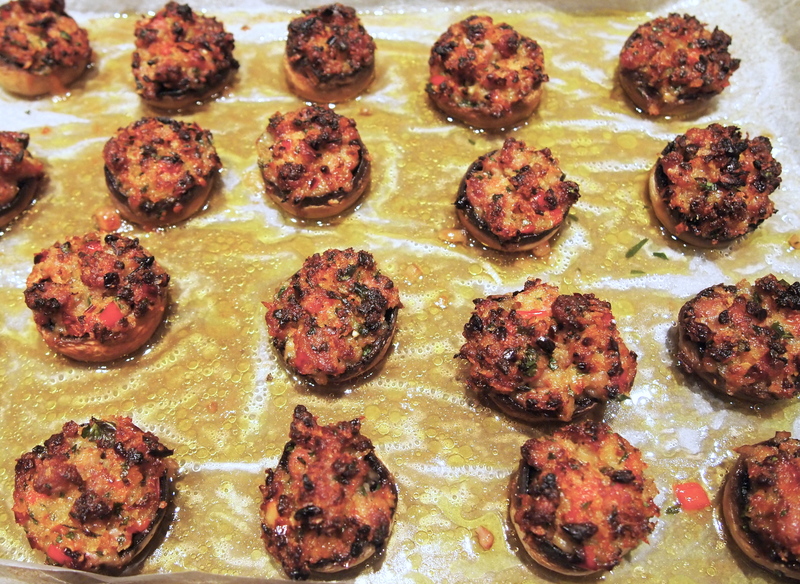 The mushrooms can be prepared in advance and kept refrigerated until you’re ready to bake them, just take them out of the fridge 30 minutes before so as they come to room temperature.